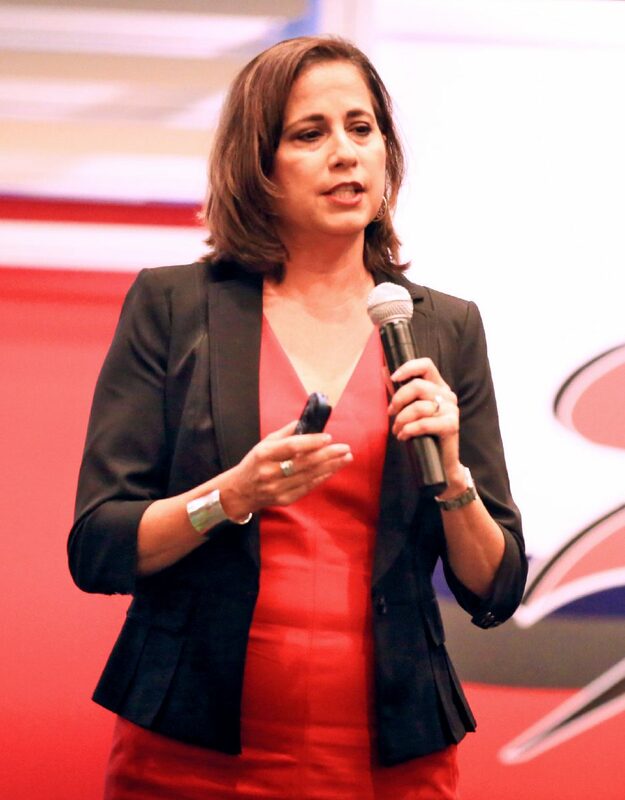 Maria Vidaurri speaks during a gathering of Sharyland ISD administration and staff at the Mission Events Center on Friday, Aug. 17, 2018, in Mission. 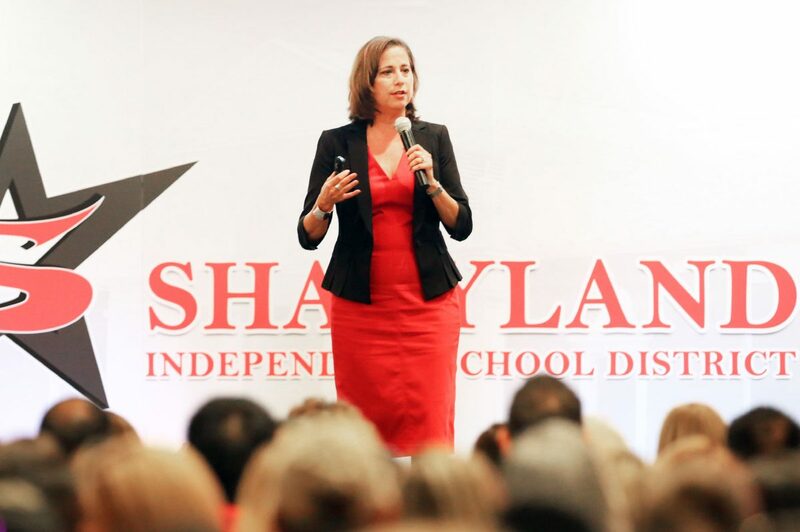 MISSION — The Sharyland school district has a new leader who’s already at work pumping up teachers and staff ahead of the 2018-19 school year. Maria Vidaurri took on the top leadership role this summer following the departure of former superintendent Robert O’Connor. But she is no stranger to the district and the Rio Grande Valley. Technically, she’s coming back to one of the places she’s called home throughout her tenure in education. Vidaurri, of Premont, earned her Bachelor of Science degree in elementary education, a master’s degree in educational administration, her superintendent certificate and doctorate degree in educational leadership from Texas A&M University-Kingsville. During her 33 years in education, she worked as a teacher, assistant principal and principal in Alice. She then transitioned into administration, first at the Hidalgo school district, later moving to Sharyland ISD as federal programs director, an assistant superintendent position at La Feria, and finally the superintendency at the Robstown school district in Nueces County, where she has been for the last five years. Was it a goal to come back to Sharyland? It’s kind of like coming back home. I was here for two years but it felt like more than that because everybody was so welcoming, and it was great. I wanted to stay here, I didn’t want to leave, but I knew that I had to go out and get more experience if I wanted to come back and serve this district in a different capacity. Is it different to come back to a district that you already know? I was born and raised on Premont, Texas, so I went back to the Region 2 area. I had spent 12 years in that region when I first started my career, moved to the Valley and I was here for 15 years. So I went back and served the last five over there at Robstown. So it’s exciting because even though we are just an hour-and-a-half away from that area, the cultures are very different. But it’s still all based on the same core, in both regions. It’s doing whatever we have to do to make sure kids are successful. But the diversity here, the economic status of the kids, you know, a lot of those things here in the Valley were a lot different. What is your main goal here in Sharyland? What I wanted the staff to know is a couple of things: I am here to serve the community, the teachers, the students. But the other thing is that I want to make sure that we continue the tradition of excellence, and that doesn’t happen by accident, it happens by design. I want to make sure that we are not satisfied with being good, that every day we are doing something just a bit different to better serve our kids. I want us to be focused, I want us to be intentional, I want us to refine the things that we are doing, and then looking at our data and saying: “What can we do just a little bit different?” Because we don’t want to be doing the same thing over and over again. And we’ll still be excellent. I mean, it’s a tradition. Our kids do well and our teachers are excellent. How did serving in your former roles shape your style or focus as superintendent? Being out in the field gives you the opportunity to understand — when you become a superintendent — exactly what the principals, the directors, the coordinators and everybody is facing. And so, I don’t like to lose sight of that. I like to visit as much as I can and sit with the team talk about it and really understand because I’ve been there. I remember what it was like. I wasn’t successful on my own. There were people there, and at the end of the day we were a team. So it doesn’t matter what role you serve, the team comes together and takes care of our own. And we’ll pull together to make sure that we are all successful, and if somebody is lacking in a little area, then we are all there together to make sure we all tackle that. It’s about all of us working toward that same goal, that same outcome for our kids. With so many districts competing for students nearby, how do you plan to address enrollment challenges? Education has become a little bit more competitive in that area, but over the years Sharyland has maintained pretty much the same enrollment. What we’d like to do is pretty much let parents know, “We know you have a choice, parents. We know that. But we are going to show you why you should choose us, by our push for values, morals and ethics. That is so important to our board and our community. We are going to show you by what we do for athletics and academics…” We want to show them that picking us is going to be the right choice by the things that we are doing and the things that we are offering our students. It’s safe to say here that we really push it in all levels; it’s all encompassing and focused on educating the whole child in all areas. Vidaurri’s former school district, Robstown ISD in Nueces County, earned a lower grade than Sharyland ISD in this year’s state accountability ratings. Her former district scored a C in overall performance — a 74 out of 100 — while Sharyland received an A.
Robstown school district’s lowest score was a D on Student Achievement due to 31 percent of students meeting grade level on STAAR testing compared to the 48 percent state average; 63 percent approaching grade level on STAAR, compared to 77 percent state average; and 10 percent mastering grade level, compared to state average of 22 percent. It’s highest score was a C on School Progress, with 58 out of 100 points on Academic Growth, due to achieving 60 percent of growth compared to the state average of 69 percent; and 75 out of 100 on Relative Performance, which took into consideration the district’s 92 percent of economically disadvantaged students and its 39 percent of students STAAR and career ready. What do you think affected the performance of your former students and what is being done to address it? In Robstown it’s always been us trying to address our low socioeconomic students and our special population students — our special education, or either bilingual students as well — we are always aware of that and we monitor that closely and in this go around we missed the mark by very little. I know now that the team has been working together and already reviewed the data and they are getting ready to meet that challenge. And I want to give kudos to the new superintendent, I think they made the right choice in Dr. (Jose) Moreno, I have visited with him looking at the scores and refining the process that we were using there… With this new system every kid counts and we have to make sure every day to address each child. The lessons learned in all of this is that all students count and we have to show growth in all of our kids, but the big thing is that we have to make sure our curriculum and instruction, and our assessments are all aligned, and making sure we are addressing each student expectation at each grade level and building upon those with rigor.